We are excited to announce a new feature allowing to better structure your Google Product Listing Ads bidding by making it relevant for each product price. So on top of our already existing methods helping to shape your Product Listing Ads campaign such as item, category and brand level bidding we are releasing one more today - an ability to structure your bids based on a product price - we call that feature the price brackets and we have made it widely available to all our customers as of today. The idea and reason behind this method is simply - not all items should have the exact same bid - e.g. an LCD TV with a price tag set to £1000 shouldn't have same bid value as a Stereo Headphones with a price tag set to £10 since usually profit from the more expensive item will be proportionally bigger than from the lower priced one thus we can afford spending more on the higher priced item. By default that is not easy to achieve inside the AdWords interface, including the latest shopping type campaign, but thanks to our partnership with Google and access to their API we were able to come up with a workaround allowing us to do it without the need of any labels, which means any changes to your price brackets doesn't require feed re-uploads and are active almost immediately. 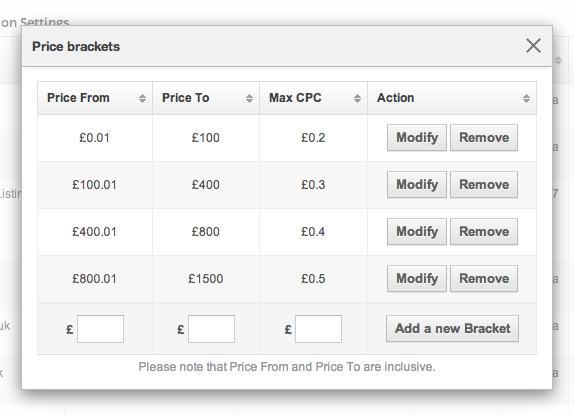 This feature is very handy for merchants having items with broad price ranges across their inventory since it allows to bid fairly across all their items with just a few simple price bracket rules, therefore, helping to optimise performance across Google Product Listing Ads campaign and bring more revenue in. To find out more feel free to get in touch.